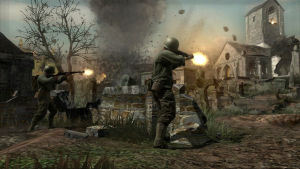 The Call of Duty games have delivered some great World War II action and numerous memorable missions. With Call of Duty 3 we have somewhat of a passing of torches. This is the first generation of the series to appear as a console exclusive, leaving PC owners deaf to the call for the first time. It also arrives on the Xbox 360 with a new developer behind it. Infinity Ward brought Call of Duty to the PC and Call of Duty 2 to the PC and Xbox 360, but it is Treyarch who brings us Call of Duty 3. If you’re new to the Xbox 360 and played Call of Duty: Big Red One on the PS2 or Xbox, then you’ve played a Treyarch game before. Why is this second thing significant? Well if you played Big Red One then you’ll remember that it was a fun game, but it seemed to lack the memorable scenes that the Infinity Ward developed games deliver so well and as a result was not quite as intense. This is exactly what you have in Call of Duty 3, a good and enjoyable game but one that lacks the intensity of Call of Duty 2. The battle for St. Lo. Call of Duty 3 follows the same format that has become the series’ hallmark. You play as several Allied soldiers through some of the more intense and famous battles of World War II. In this outing you’ll start as an American GI at the battle of St. Lo. and then move on to play as a member of the British SAS, Free Polish Forces, and Canadian Army. This time out the Eastern Front fails to make an appearance and the action is all set in France in the months following the Normandy invasion. The game relies heavily on scripted moments to push the story along, but in general they work well and are integrated into the action nicely. There are some odd moments when you’ll find the action quieted to a dead silence simply because you need to find your way to the next objective point that will trip the next sequence, though. Call of Duty 3 dispenses with the whole health meter and medkit mechanism in favor of one that will allow you to recover your health when out of harm’s way. If you take a couple of hits, you just need to duck behind the nearest obstruction and keep low for a few seconds. You’ll know that you’re ready to go again when the red halo around the edges of the screen fades from view. This system works pretty well and is no more artificial than the whole magical medkit thing, but it doesn’t make you invincible. You can easily be mowed down by a German or two if you’re not careful. Speaking of the Germans, the AI in the game is a mix of good and not so good. In the more open areas and in the larger scale engagements they do a good job of using cover, moving to flank you, and taking over for fallen comrades manning machine guns. In tighter quarters and in one on one situations things start to fall apart. When defending a building you can basically sit behind an entry way and drop the Germans like flies as they come streaming in. They seem completely ignorant to the fact that there is a pile of bodies sitting in the doorway and happily walk right into your gunfire. At other times they can be very slow to react, so you can run into a room and have time to fire a few rounds into a couple of soldiers before any survivors begin to return fire.